I did not want to wade into the Colin Kaepernick story, but the Chicago Bears $14 million new quarterback Mike Glennon compelled me. Glennon, a career backup, was handed a huge contract to be the Bears starting quarterback. He got that contract after missing the 2015 season and playing all of two games in 2016. Glennon’s performance with the Bears has been dreadful. He had a quarterback rating of 0% after the first game. He was barely better in the second. Glennon has been so bad after two exhibition games that one fan tweeted that Glennor makes him dream for the return of Jay Cutler—-which is about the worst recommendation a Bears fan can make. Glennon is the standard-issue white quarterback whose lack of athleticism and mobility, combined with a weak arm, has kept him mostly on the bench during his career. But he has one thing going for him: he always stands up for the national anthem. While Kaepernick remains unsigned, the Bears’ third string quarterback—Mark Sanchez—remains in the NFL. Kaepernick is light years better than Sanchez. He took the 49ers to a Super Bowl while Sanchez left a generation with nightmares for years. Some Jets fans had to stop watching football to avoid seeing Sanchez cost the team another victory; but he has an NFL job because he rises with the national anthem. What’s happening with Kaepernick is no different than what occurred when major league baseball long owners denied African-Americans the right to play in the majors. Baseball had no rules against a team bringing in Satchel Paige or Josh Gibson; owner insisted that no black player was good enough to play in the majors. That Paige and other African-American stars proved their greatness during post-season barnstorming games played against Babe Ruth and others meant nothing; the owners insisted they lacked the skills to play in the big leagues. Owners insisted racism was not involved. 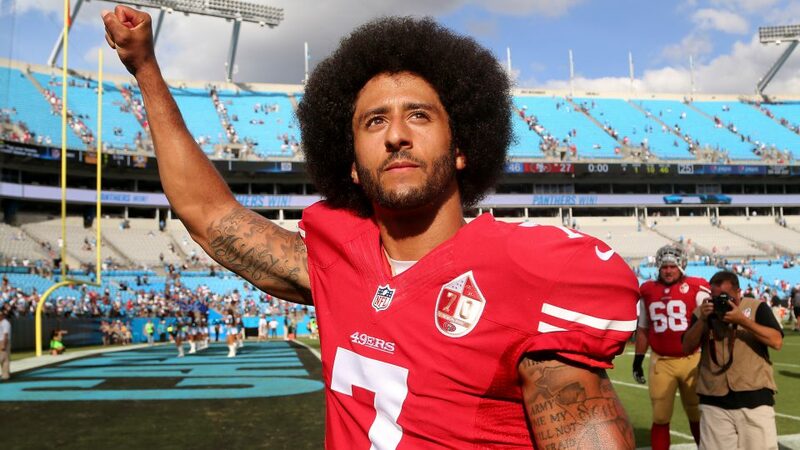 Many believe there are 10-15 quarterbacks who lack the talent or demonstrated ability of Colin Kaepernick. But like the long woeful Bears, NFL owners would rather lose games than alienate the primarily white male fan base that goes to games. I’ve gotten extremely down on the NFL over the concussion issue, particularly when I learned that Bears legend Gale Sayers also suffers from dementia. The combination of the racist politics of NFL owners and their disregard for players’ safety has turned me against watching games. Better to stick with watching Ballers, where nobody has gotten a concussion or been denied employment because they expressed a view that police violence against African-Americans is wrong.